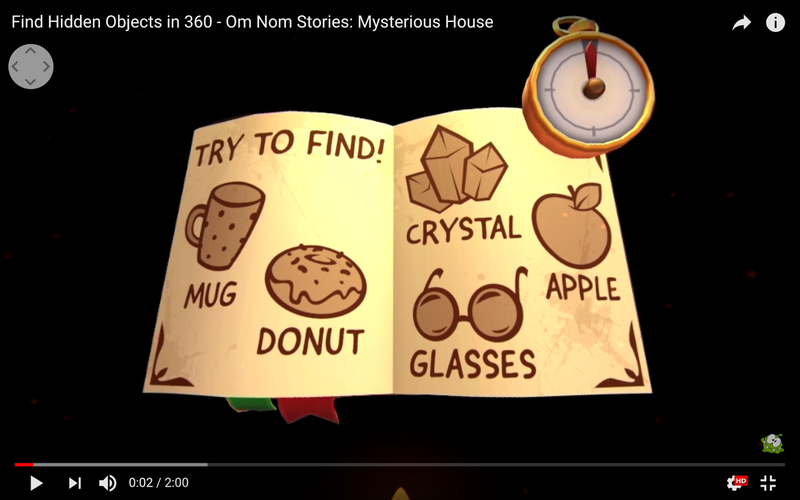 Find List for "Find Hidden Objects in 360 - Om Nom Stories: Mysterious House"
As shown in above screenshot, they want you to find the "5 hidden objects: (1) Mug, (2) Donut, (3) Crystal, (4) Apple and (5) Glasses" in it ? It's not very difficult but quite interesting, you have to use a proper browser or viewer which supports 3D browsing to navigate around. The answers are revealed inside the video when the time runs out but I find it a bit hard to navigate around to see all the 5 locations, so I saved the locations in 2 screenshots for you to view in the Answers page. This is also Puzzle No. 125 in the Puzzles page.